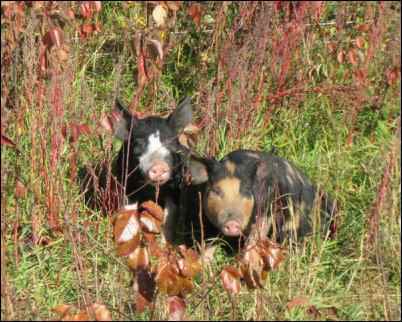 Early in our farming venture, the first year we kept pigs is one that stands out in my memory. Well-read and well-intentioned, my husband and I had discussed beforehand how no homestead could be complete without the addition of pigs. 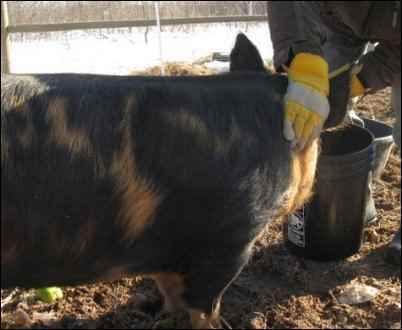 The pig is a paragon of farmyard virtue. No other animal possesses such efficient feed conversion. 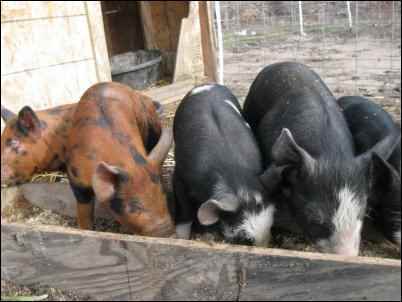 Our pigs were not required to be “mortgage-lifters” as they once were in barnyards across North America. They would, we reasoned, supplement our small but growing farm income. We would raise a few at once, keep one for our own freezer and sell the rest at a profit, making the whole venture self-sustaining. It was a brilliant plan and as far as we could see, simple to execute. Upon further discussion we felt we’d be foolish to pay for weaners (weaned piglets, a state of matter about eight to ten months prior to “wieners”) every year and decided to jump in with both feet and purchase breeding stock. The money from all their grown piglets sold would more than pay for their upfront purchase price and then we’d be ankle-deep in weaners for the years to come. We planned on raising them in our pastures and oak forests, supplementing their foraging with soaked grains and garden waste. Deciding on the right breed was important to us. Living in Manitoba, Canada, our winters were long and harsh. With no barns and only small shelters our pigs would have to overwinter well and come through at the end of it still able to raise a litter. Research promoted the Berkshire and Tamworth breeds for our circumstance. Of British origins, they were ideally suited to pasture life. Hardy and good mothers, they were our pigs. After locating a breeder we decided on one boar and two gilts (a young, female pig). At this point we felt only a small hesitation at dealing with a boar when we had no knowledge of how to deal with pigs, but experience is the best teacher, we reasoned. We hooked up the trailer and set out on a three hour drive through the beautiful rolling hills of Cypress River, Manitoba, to pick up our piggies. The fact that the people, despite expecting us, had not rounded up said pigs should have served as a red flag. With sinking hearts we trudged out to a lush, half-flooded late-Spring pasture whose grasses almost brushed our midsections. “They’re in there,” the farmer jerked his thumb. Indeed it appeared not only did we have to find these piglets in the grass, but also attempt to catch them in a roughly ten-acre pasture. Defeated, we both looked at the farmer. “I brought a bucket,” he said helpfully and proceeded to bang on it with a stick and call for the pigs. Like something out of nightmare, enormous black shapes materialized from the shadows. They were still with their mothers and the sows (roughly the size of our sofa at home) glared at us with belligerent, glittering eyes. The ensuing hours were a blur. Given the circumstances, we agreed later, it was amazing it had only taken us one hour per pig caught. The mothers proved not to be as fearsome as they seemed, and while they barked insults at us as we hurled ourselves upon their weaned children, none attacked. Coated in slick grass, mud, and pig excrement we finished. Bruised and battered we drove home in silence. I’m not sure what my husband was thinking, but I was wondering how we were going to handle them (particularly the boar) once they were bigger. We unloaded them without incident into their new pasture. A small division of about an acre with three low strands of electric poly-wire and step-in posts, they were duly incarcerated. In preparation for their arrival a small shelter had been built out of scrap lumber kicking around the farm, and it was packed with fresh, clean oat straw (I’ve always thought it a great pity that straw doesn’t taste as good as it smells). We laid their troughs in close proximity to the fence so we wouldn’t have to actually go in to feed them. They grew monstrously, and we watched with a morbid fascination as they barked and slavered and jostled when we lifted their bucket of soaked grains and scraps. Upending the bucket unleashed chaos. 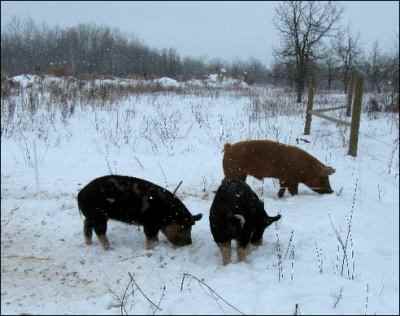 Every pig was solely concerned with shoveling in the most amount of food in the shortest possible time. A far cry from our placidly munching cows and sheep, the pigs were barbarous. Sated only when every morsel was gone, they’d jiggle off to throw themselves into hollows with deep satisfied grunts, and sleep the sleep of Hedonists. It was easy dealing with them so long as we didn’t have to enter their paddock. I would feel dread the day before I knew something needed to be done in their territory. Often they would heave their massive bulks against the troughs (homemade affairs like everything else on the farm) and shove them into the middle of their pen. Some brave soul would have to step over the electric, pail in hand, and after depositing a distracting pile of grain bolt over and move the troughs to their original location. All this before the pigs decided to see if they could eat you. I’ve yet to determine whether it’s something peculiar to the Berks and Tams, but even subsequent examples of these breeds have been keen to discover if we’re edible. I never felt any malice behind it, but the fact remains if you stood still for more than a moment a pig (usually the boar, but often the gilts) would come and take a bite. We took to going in only when absolutely necessary, and in pairs. Armed with great sticks, one would be defense, the other perform the required task post haste. The ground in their paddock was uneven from their rooting and you had to watch your footing. We didn’t dare trip as by this time they outweighed us by one hundred pounds and we were sure they were only waiting for a chance to eat us. They had their affectionate moments too. One girl in particular, enjoyed jowl rubs tremendously and I became quite fond of her. True to their hardy reputations they grew and thrived despite the coldest winter we’d had in a long time. With daytime temps routinely -30C (-22F) they buried themselves deep in the straw, together in a warm pile. When they emerged, blinking in the bright light, their skins would steam. Spring came and although we had watched eagerly all winter for evidence that the boar knew what he was supposed to do with his harem, we saw nothing. Our gilts, although now more than a year old, were definitely not pregnant. Perhaps there was a porcine aphrodisiac we could administer to the boar (possessor of the original name of “Boris”)? He had yet to be seen to show any amorous inclinations towards the two lovely gilts he shared his life with. Yet for all that, he was a spectacular specimen in appearances. Enormous, the color of copper, with enormous…male attributes, how could there be a problem with his libido? We had failed. 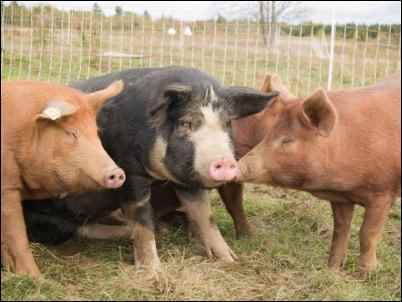 These pigs would never breed, and if they did, by that point we had wisely started to question how we could deal with 20+ pigs when we could barely handle 3. A snap decision was made. Boris would be re-homed if possible and the two original gilts would go to slaughter. We could still salvage something, besides experience, from this situation. We had cared for them for 15 months and despite their obstinate natures and the fact that they posed a risk to our skins every time we entered their pen, I had become more attached than intended. As we had never planned on eating this bunch, I had allowed myself to observe personality, and they had been named. Any farmer will tell you it’s harder to eat something that you’ve named. All our food animals do have names of a sort, it makes it easier when speaking of the individuals, but these names, while unoriginal, leave no doubt as to their purpose, names such as “Beefy”, “Sir Loin”, or “Bacon”. Arrangements were made; Boris went off to a second chance, this time with a bunch of Southern Gals (a few mulefoot sows) where we wished him better luck. His new owner (aware of Boris’ potential shortcomings) said he wasn’t worried as his girls were “very seductive”. After trying to bleach this comment from my memory, we set about loading up the girls. For once I was glad of the (ridiculous) law in Manitoba requiring all meat sold to be slaughtered in a provincially-inspected abattoir. I couldn’t have done them. I felt a small sense of shame as “Bella” followed me willingly onto the trailer, grunting contentedly as I rubbed her jowls. Poor Bella, her trust in me was so misplaced. Lucy was another matter. Always the histrionic pig she careened about squealing with the eardrum-bursting pitch peculiar to an agitated pig. It took four of us holding a welded-wire cattle panel bent into horseshoe-shape to “scoop” her into the trailer, all the while fighting against her 350-pound bulk as she gnashed her teeth and tried to flatten us. So off they went. We sold “Bella” as I had no desire to eat her, but we enjoyed eating “Lucy” tremendously (especially given the fact that my husband’s pinky was broken by her attempts to escape the panel and had yet to heal correctly). Best. Pork. Ever. For us, owning pigs was like childbirth; after it was all over and we had the spoils to enjoy, the pain and travail faded from memory. We found ourselves buying pigs again the following season. Every year now we do this, and like most things on the farm, we get better and more efficient at it. No more catching pigs in a pasture, no more making friends, no names, plywood shields for loading, we’re set. Our customers love the bucolic picture (mental and actual) of an free animal enjoying it’s life outside on grass to the fullest. 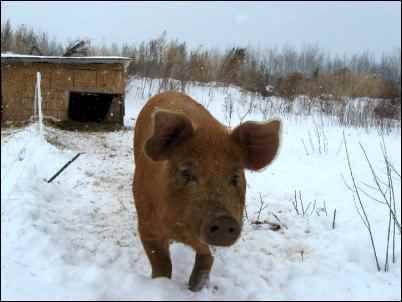 We have others who buy our breeding stock and I always try to see if they’re ready for the reality of pastured-pig ownership: wear the highest boots you own, make sure you have an escape plan, and try not to get too attached.